What makes TRT different from other Jewish schools? When I was in Hebrew School, you had two very clear choices: conform to the schedule, content and student population, or find a tutor who would privately help you achieve your goal, most often just the bar/bat mitzvah ceremony. I went three times a week to an orthodox, Sephardi school where I learned two things: I loved learning this stuff, and I couldn’t use what I learned in class when I sat high up in the women’s section on Shabbat morning. 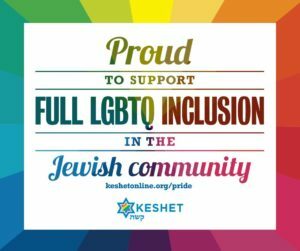 That feeling of being on the outside looking in stayed with me until I got to college and realized that I could return to the Jewish classroom, alongside my male peers. I went straight to rabbinic school after graduating, and never looked back. But the feeling of being on the outside never truly left me. So whenever I notice one of our students, or prospective members, hiding behind what they think is THE ONLY WAY to learn about Judaism – which means they will be excluded – I’m 13 all over again. Whether they are girls who are told formal Jewish education is unnecessary, or children who learn differently, or who struggle with challenges that have not been addressed by their “Hebrew School,” we respond to them. We believe that Jewish Education must evolve in order to best serve all the members of our community. What I love about TRT is that here, if we haven’t done something before, we’re willing to try it. Even if it means radically tailoring the schedule, or the focus of our curriculum, or the method of teaching, we want to accommodate our students with special needs. We have become a nut-free school, as stringent as we can be to ensure the safety of those who are allergic, and we have additionally altered our holiday celebrations to include those children who cannot have milk or eggs or other allergens. We have doubled our aide program so that students who need one-on-one attention can get help to stay in the classroom with their peers. We have tailor-made entire curricula to accommodate kids on all points of the autism spectrum, so that every child whose parents have challenged us to find a way to include him/her will know that we will do whatever we can to be responsive to the needs of their sons and daughters. We have included use of new technology, such as iPads: if it enhances the learning experience, it is not only permitted in the classroom, it is encouraged. When I was in school, we had no alternatives if we needed help to get a meaningful Jewish education. At TRT we will work with you to change that reality. We are a small school with restrictions of space and resources, but we do not accept negative assumptions that prevent people from feeling connected to the Jewish community. In coming months, we will highlight some of our students and their efforts to study Judaism; read and be inspired. We know that we still have a great deal to learn about innovations that can expand our capabilities to provide the best Jewish learning for our students, many of whom have been left on the periphery of our student population.